Recent studies have found that 46% of new hires fail within 18 months and, in 89% of these cases, the reason was due to the employee’s poor company culture fit. It isn’t surprising, then, that companies are increasingly prioritizing cultural fit when considering candidates to hire. Spark Hire’s recently launched whitepaper aims to help staffing professionals better assess candidates for cultural fit within their client’s company. The whitepaper discusses the importance of staffing professionals first identifying and understanding their client’s company culture in order to find them the best candidates. The most common types of company cultures are: Top-Down, Customer-Facing, Collaborative, and Innovation. These company cultures have various differences, therefore, the kind of candidate who would fit well in one will most likely not be the kind to perform well in another. By diving deep into a client’s company culture, staffing professionals can ensure that they are only presenting candidates with the potential to succeed in their organization. Technology, such as video interviewing and social media, are powerful tools that staffing pros should take advantage of for recruiting candidates. One-way video interviews, where candidates answer questions in short videos, can be especially useful because they provide staffing pros a more personal look so as to determine a person’s company culture fit. If a candidate doesn’t immediately come off as someone who will be successful at a client’s company, staffing pros can simply move on to the next person’s video. Additionally, recruiters can use social media to communicate and engage with someone before a formal interview. Recruiters can also evaluate candidate’s social media profiles for insight into their personality, interests, and potential company culture fit. 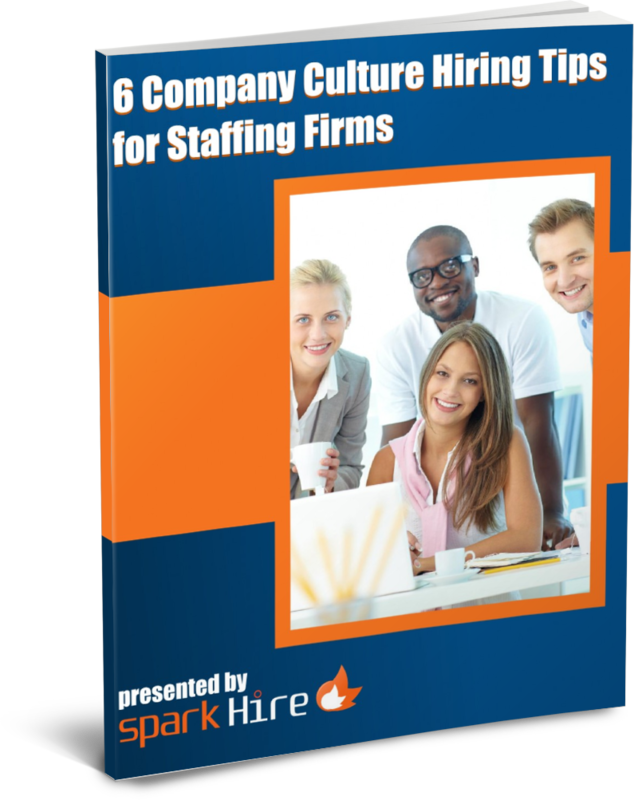 Download the new whitepaper, “6 Company Culture Hiring Tips for Staffing Firms”, from Spark Hire and find top-notch talent that will meet the needs of your valued clients.